In A Snitch in Time the Three Stooges (Moe, Larry, and Shemp) are working at “Ye Olde Furniture Shoppe” where they make custom furniture and are two weeks late on an order for Miss Scudder’s boarding house. The typical slapstick horseplay ensues, with some very good moments. For example, Larry puts the final drawer into a dresser, and repeats the old gag of sliding the drawer in causes another drawer to pop out and hit him. However, he decides to “solve” the problem by nailing the drawers shut! Likewise, Moe nearly saws through his hand, Shemp uses a plank of wood to accidentally knock Moe into a buzzsaw, and later accidentally glues Moe’s eye shut. 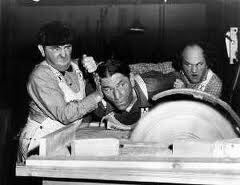 Only for Larry to Shemp to “help” him get his eye open with a hammer and chisel, back Moe into the buzz saw again, etc. To complicate things, Moe is sweet on Miss Scudder, and would have asked her for a date. If he hadn’t accidentally cut through the phone wire. A very funny scene where Shemp keeps interrupting Moe to attempt to tell him about the wire, and Moe alternating between being short with Shemp and sweet with Miss Scudder. Later, when they deliver the furniture to Miss Scudder, it turns out that the Stooges need to stain the wood a different color. They get to work staining while eating the sandwiches and drinking the coffee that Miss Scudder has nicely provided. The scene is reminiscent of the exact same scenario from Tassels in the Air, with Shemp taking the place of Curly. The short film then changes gears, however, as Miss Scudder’s new boarders turn out to be thieves, matching the description of the radio news bulletin that Shemp and Larry are listening to. Just as they turn around and bump into the gangsters themselves. The remainder of the short is a typical frenetic chase scene. It has some very funny moments, such as the gangster guarding Larry and Shemp sitting down in a freshly varnished chair, Moe and Larry fighting with an armed gunman through a sliding door, pointing the gunsel’s gun at Larry rather than himself, eventually disarming the man. With Larry getting punched by the arm when he looks to see if he’s still there. Eventually, the police arrive and all ends well. Until Shemp demonstrates the impromptu trap that he had rigged up, causing it to splatter all over Moe – in front of Miss Scudder. A Snitch in Time is an enjoyable Three Stooges short film, and I rate it 3 clowns out of five. It’s available on DVD as part of The Three Stooges Collection volume 7. Larry Fine: Moe! Moe! I finished the drawer! Moe Howard: well, what do you want me to do, kiss ya? Moe Howard: Put on your best bib and tucker. Don’t forget, we got a date! Shemp Howard: [holds up cut through phone wire] No you ain’t! Moe Howard: With these helpers, I’m helpless! Moe Howard: When I want a haircut, I’ll go to abarbershopp! Shemp Howard: Camel’s hair brush? [picks off lump of glue] Hmm, must be the hump! Ms. Scudder: Well, I hope you do a good job. Moe Howard: We sure will. You won’t recognize the stuff! Moe Howard: Does my head look like hardwood?! Shemp Howard: Well– [Moe slaps Shemp] I didn’t say it did! Moe Howard: Well, ya thought it! Moe Howard: Now this time for a change, get some stain on the table!